J. Jane Consulting | sharon lhamon. st. mary’s, ohio. | sister. wife. mother. aunt. educator. Leaving the world better than how we found it is the measurement of a life well lived, and whether we accept the challenges or not, life often presents opportunities to help another person breathe a little easier. Sharon Lhamon is a woman who accepts life’s challenges with enthusiasm, kindness, and grace. I am the lucky few who get to honor several women on Mother’s Day. I celebrate my mother Rita Elaine, who gave me seven incredible siblings before tragically dying from breast cancer. My Aunt Mary Jane, who quickly became a mother to her only sister’s four, then eventually eight children. Ronnie, my remarkable mother in-law. And Sharon, my foster mother of one year, who still fills the role of a motherly confident and friend. Today, I am honored to introduce you to a woman who made a tremendous impact on me when I was ten years old— and who continues to inspire me thirty years later. Born Sharon Ann Bertke in 1952, this blonde swimming sensation was raised in Celina, Ohio. Her parents, Cy and Dorthy Bertke, who lived through the Great Depression, were determined to give their three children a stable and happy life. Sharon’s mother was a homemaker and her father worked as a factory worker — instilling a strong work ethic and passion for education in all three of their children. 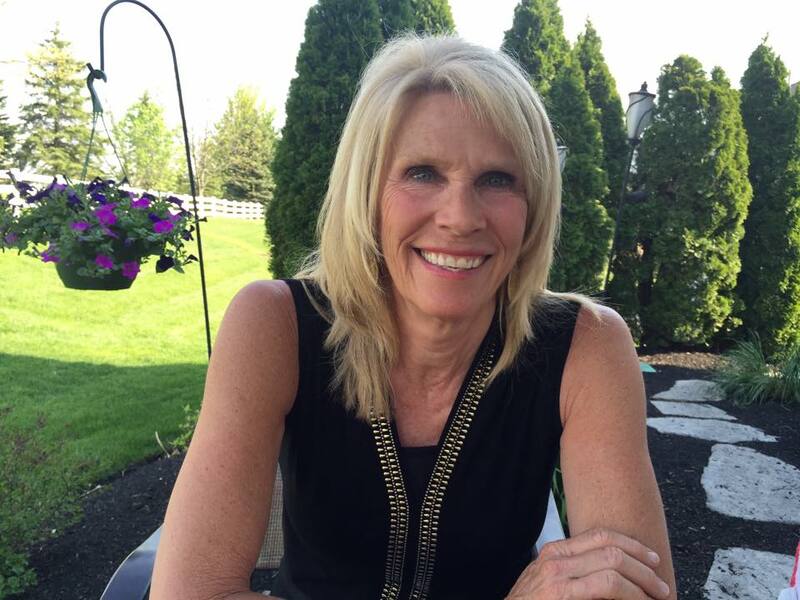 Sharon attended the Immaculate Conception High School in Celina and went on to study at Wright State University. During a summer break in college, she worked as a life guard at the Grand Lake St. Mary’s. This is where she met Army Staff Sergeant Mike Lhamon, a Saint Mary’s native who had just returned from serving in the Vietnam War. The young couple fell in love and raised their two children in the small town that is situated next to the grand lake. The Lhamon family believes in making the world a better place — and I can assure you — they do just that. How did you choose the your career path and was it a conscious decision? I chose to be a teacher when I was in elementary school. I loved school and enjoyed success in the classroom. I even kept a notebook of interesting and fun activities and games that could be used when I grew up and became a teacher. For some reason, I was entirely self-motivated, which turned into my biggest challenge as a teacher. What was the most frustrating experience of being a teacher? Everyone isn’t self-motivated. Some children are very passive participants in learning. What was the most rewarding thing about being an educator? Helping kids achieve their goals and challenging them to be the best people they can be. How did you decide to become a foster mother? The summer that your mother was so ill with advanced breast cancer, it became clear to the Holy Rosary parishioners that your large family needed help. Involvement started in a small way with meals and some clothing donations. When your mom passed away the week before school started, a couple of friends and I decided to treat a few of your siblings to a little shopping trip to get a new outfit for the first day of school. You all enjoyed our afternoon together and just warmed our hearts with your sweetness. Upon arrival back at your house, your dad said that he was going to move from Ohio to Florida to be able to make a better living in real estate. He hoped to leave the eight children with family and friends for one year to get his feet on the ground. Although we were acquaintances, rather than close friends with your parents, we had room in our home for the three of you… and your dad liked my husband Mike and me. He knew us well enough from church when we offered to foster, he accepted. We were struck by the sadness of the situation and felt compelled to help. How did you prepare your own family for the foster care experience? Was Andy afraid of being overrun by females? I think he played the 45, Hot Blooded, two thousand times that year in an effort to combat the feminine energy in the house. We asked our own kids, Andy (grade 3) and Katie (Kindergarten), what they thought of the idea and they were very excited to help. Our own parents, looking at the more practical side of things, were a bit reluctant to encourage us. Friends lent us beds and dressers, my parents cleaned our house every other week while we were in school, my card club chipped in some cash to help us with Christmas, and a neighbor did a few loads of laundry every weekend for me. And lots of people prayed for us! The music may have helped Andy cope… even though he did enjoy having a few more sisters. What was the most difficult thing about being a foster mother? Helping you deal with the intense grief of losing your mother, and at the same time being separated from your dad by a thousand miles was extremely difficult. Our hearts ached for you, but at the same time, we had to be positive and upbeat to keep the family afloat. Our own daughter was wrought with terrible separation anxiety and was unable to communicate her fears to us. One day, while she was playing dolls with a friend, we heard her express her worries through play. The doll’s mama died and Katie said to her friend, “If your mom dies, who will you live with?” Her friend said, “My dad.” Katie said, “No.” “My Grandma.” “No.” “My Aunt.” “No.” Finally Katie said, “You have to live with someone that you hardly know.” After that, we were able to better address her fears and she slowly was able to let me go to school without a complete breakdown. Were there ever a moments of regrets during that year? If so, how did you work through that? You know, we did not feel any regret. We chose to invite three girls into our home and talk about nice girls! You all were kind, cooperative, fun-loving, creative – you could not ask for anything more. Our own children loved you and we loved you… and we still do! Do you remember making me do my homework at the basement chalkboard? I was really upset about that. It may have been the first time anyone made me do homework. When we went to parent/teacher conferences, the one thing that I remember is that JJ’s (j.jane) fifth grade teacher said that she did not know her multiplication tables, but it was okay because she had been through so much. I remember Mike, my husband, saying that was not acceptable… thus the chalkboard drills and practice. We wanted you to learn and use your talents to do your best in school. We felt that your future depended on it. Do you remember the first bra you introduced me to? It was awful. It looked like a sports bra and it had a little purple flower in the middle of it. I took it off at the bus stop more than once. You needed a training type bra for your t-shirts and tops to be presentable. Most girls were thrilled to wear a bra, but for some reason, not JJ. You had strict household rules. Do you recall that time that Debbie Getz (my B/F/F) took me to the Dairy Queen and I lied about getting a pop? I still feel guilty about that. (Catholics!) Debbie Getz told me know one would ever know. She lied. We are both sorry about that. We just wanted to make adult decisions. Also, the sugar tasted so good on the lips. Soda pop was a treat for a weekend night with pizza or popcorn. It was one of my “healthy” rules. I still practice a healthy lifestyle. And while we are on the topic, do you remember that time we were at the St. Mary’s pool and Debbie Getz and I said we had to go back to her house to get a pool towel? We lied. She wanted to watch her favorite soap opera. She said it was the “best show” on television. She unknowingly lied. At the time, I didn’t know what a soap opera was and Debbie Getz wanted to enlighten me. It turns out that it wasn’t a very good show, despite it being the longest running soap opera in American history. Did you ever know that about us? Yes, I remember that you wanted to leave the pool and go down the street to Debbie’s. I said, “Sure, but take the other kids with you.” That’s the hot day my girl friends and I slipped over to our house and had a cold beer before returning to the pool to meet up with you kids again. Did you really love your dog, Cookie? It was the most annoying dog ever. He barked and barked and barked. Did anyone love Cookie? That damn dog barked incessantly. Once we adopted Cookie, we were stuck with him. I never wanted a dog in the first place, but Mike promised to train him… promise broken…stuck with a misbehaving dog. Loved the dog. Hated the behavior – go figure. Raising two great children, and participating in the lives of three wonderful foster children, while having the chance to influence a lot of lives in a 35- year teaching career. Look at life with an open mind. It’s amazing how much happier you will be. Happy Mother’s Day, Mother Lhamon! Sharon’s daughter, Dr. Katie Vanderhorst participated in The j. jane Project a few months ago. Enjoy Katie Vanderhorst’s interview here — the fruit never falls far from the tree. It seems it is undetermined who is responsible for the following quote, Ralph W. Emerson or Bessie A. Stanley. Either way, it is a favorite of mine. Jess, what a wonderful tribute to your foster Mom. You are so resilient! You know I admire and adore you! Keep up the great work. Wonderful blog on an amazing, inspirational lady. One recollection from her year as a foster Mother to you three great girls that you may never have noticed. She developed a wierd eye twitch soon after you moved in that I was compelled to research. An eye twitch I found is often caused by extreme stress and exhaustion or lack of sleep, yep, that described Sharon! I think the whole experience of the year strengthened you girls and all the Lhamon family as well. This does not surprise me! Mother Lhamon is the best. Another great story JJ. I never knew all of the details until now. The story brought tears to my eyes. What a wonderful family they are and all of your siblings have overcome some great obstacles and done so with such grace. So very proud of all of you. Sending love and hugs from myself and Uncle Gary. I could read this over and over again. What a beautiful story! Jessica, thank you for sharing such a personal interview! Your foster mom sounds like an amazing woman. Thank God for placing her and her family in your family’s life. I’m so moved by this story. THANK YOU!